Joan Semmel's Sunlight (1978) is included in the group exhibition Scenes from the Collection at the Jewish Museum, New York, NY. For the first time in 25 years, the Jewish Museum presents a major new exhibition of its unparalleled collection. Scenes from the Collection transforms the entire third floor with nearly 600 works from antiquities to contemporary art, many of which are on view for the first time at the Museum. Art and Jewish objects are shown together, affirming universal values that are shared among people of all faiths and backgrounds. The Jewish Museum’s collection spans more than 4,000 years through nearly 30,000 objects, including painting, sculpture, photography, decorative arts, ceremonial objects, antiquities, works on paper, and media. Viewed through a contemporary lens, the collection is a mirror of Jewish identities past and present. 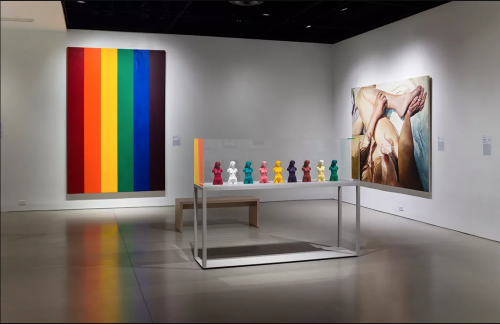 Instead of a single narrative, Scenes from the Collection is divided into seven different sections, or scenes, highlighting the diversity and depth of the collection. Each one reveals the ways in which the presentation of art and history are shaped by context and perspective. The new installation is a powerful expression of artistic and cultural creativity as well as a reflection of the continual evolution that is the essence of Jewish identity. This unique mix of art and ceremonial objects speaks of the many strands of Jewish tradition, culture, spirituality, and history. The stories the works of art tell illuminate multiple perspectives on being Jewish in the past and present, how Jewish culture intersects with art, and how it is part of the larger world of global interconnections. Scenes from the Collection is flexible, with several scenes changing annually, and one changing every six months, so that different subjects can be examined while audiences are offered opportunities to see as much of the collection as possible, including new acquisitions.